You probably have to go all the way back to “Gladiator” to find a film from Ridley Scott that display’s the quality seen in “The Martian”. Not the first choice to direct this book to film adaptation, the 77-year-old director certainly understands space and gives us a lot of it. “The Martian” isn’t a normal isolated acting performance like we recently saw with “Gravity”, as a narrative it’s a lot more like “Cast Away” as we watch our lead character learn to adapt in his new surroundings. The film is very technical and uses science as a method of survival, but somewhere in there the emotion gets lost and prohibits this story about a corporation putting unlimited resources into saving one man to become heartfelt. Ares III, a mission that has taken the latest and greatest astronauts to Mars, has encountered a severe storm on the red planet that is 50 million miles away. Captain Lewis (Chastain) orders everyone back to the ship for emergency departure, however botanist Mark Watney (Damon) is impaled by flying debris and lost in the chaos. Ares III blasts off headed back to earth, which will take 4 years, and their mission which was supposed to last half a year is over after only 21 days. A month after the tragic incident, NASA notices something strange on Mars, and it isn’t water. They realize Watney is still alive, alone and without enough food to last long enough for a rescue mission. What the film lacks in emotion it almost makes up for visually. 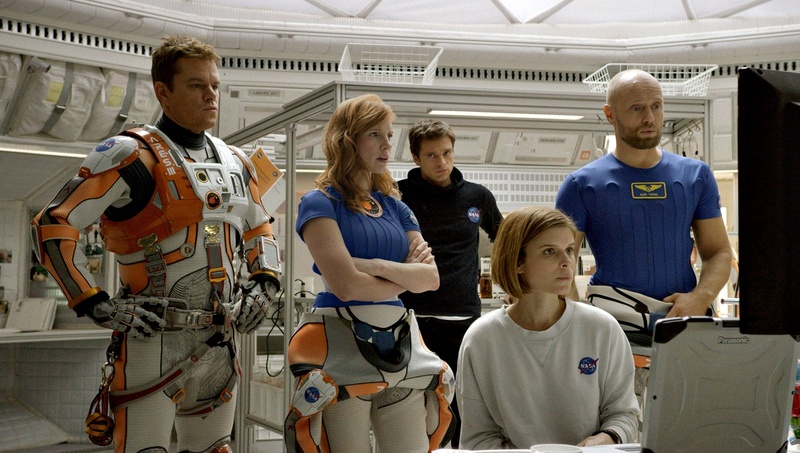 “The Martian” begins with a bang and is certainly a riveting thriller about survival but Scott and screenwriter Drew Goddard (“Cabin in the Woods”) keep the film focused on hypothetical plausibility. A variety of cameras (IMAX, go pro, etc) are edited in sync to give the viewer a real time perspective of Watney’s situation and the events taking place simultaneously back on Earth. “The Martian” aims and succeeds at showing NASA as a community all working together as one body for the sake of one man. Yet at the same time asking if all this effort, money and additional lives risk worth saving one stranded astronaut. The huge supporting cast gives a name and face to seemingly the most insignificant personal. Damon who is on screen solo for most of the film nails the comedy in the script to keep the audience engaged. Daniels is a standout in his limited screen time as the tough as nails NASA director. What the film lacks in emotion it almost makes up for visually. Cinematographer Dariusz Wolski turns the red deserts of Jordan into a stunning Mars landscape with the addition of some special effects, topping even their breathtaking work on “Prometheus”. We are constantly reminded of the desolate and unforgiving terrain by breakaway wide shots used to showcase Watney’s imposition. Like most space thrillers, hope is built and burst on a roller-coaster rescue ride which makes the conclusion of the story the most important. Damon certainly has the right flare of arrogance (as evidenced in recent interviews) for the marooned Martian and like Scott, it’s some of his best work. Yet for all its running time (over 2 hours) can’t touch the recent space centered thrillers of Alfonso Cuaron or Christopher Nolan. Gripping and technically intelligent but lacks an emotional connection.